This is a very handsome early 20th-century desk set. 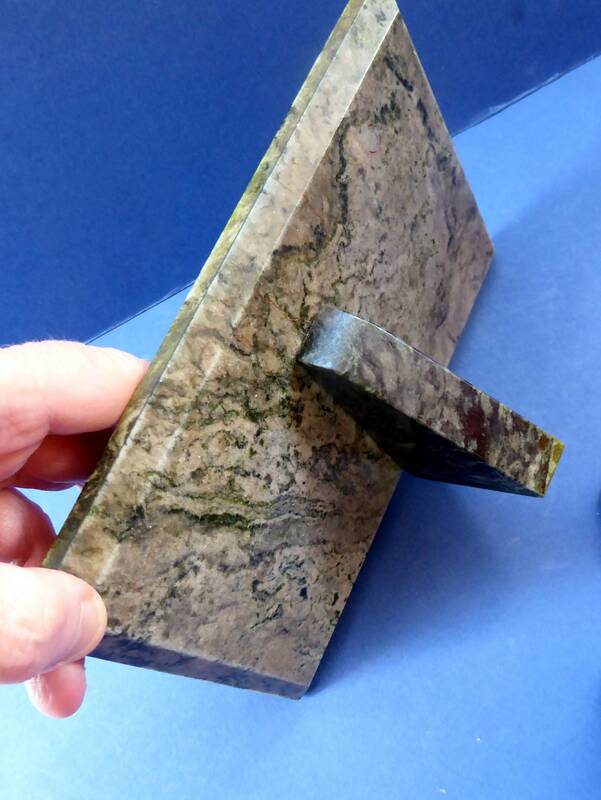 On offer here are the four items in my photographs which are all made of a matching green marble. 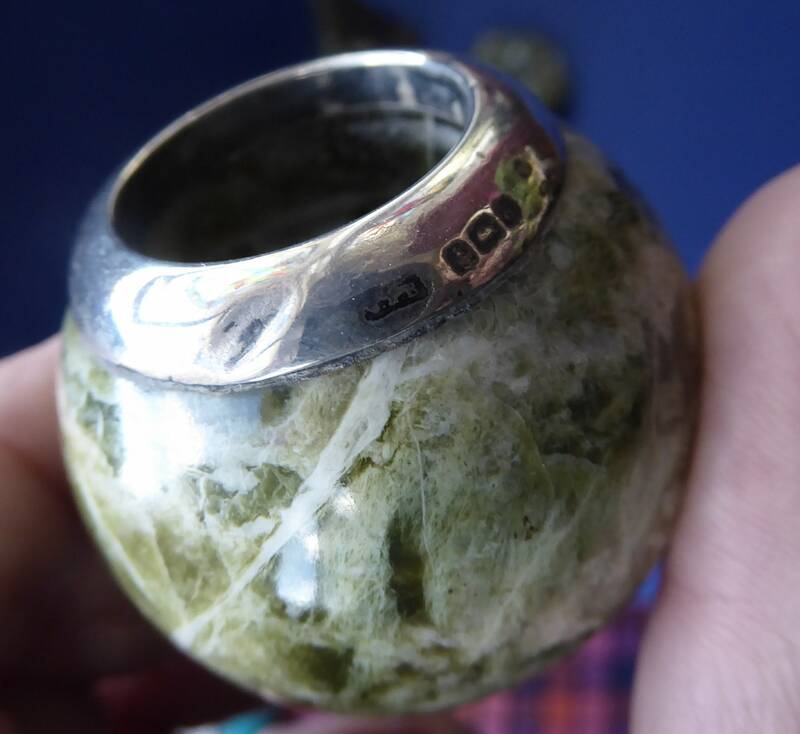 The stone is hard and polished with a beautiful white marbling through the olive-emerald green colour. 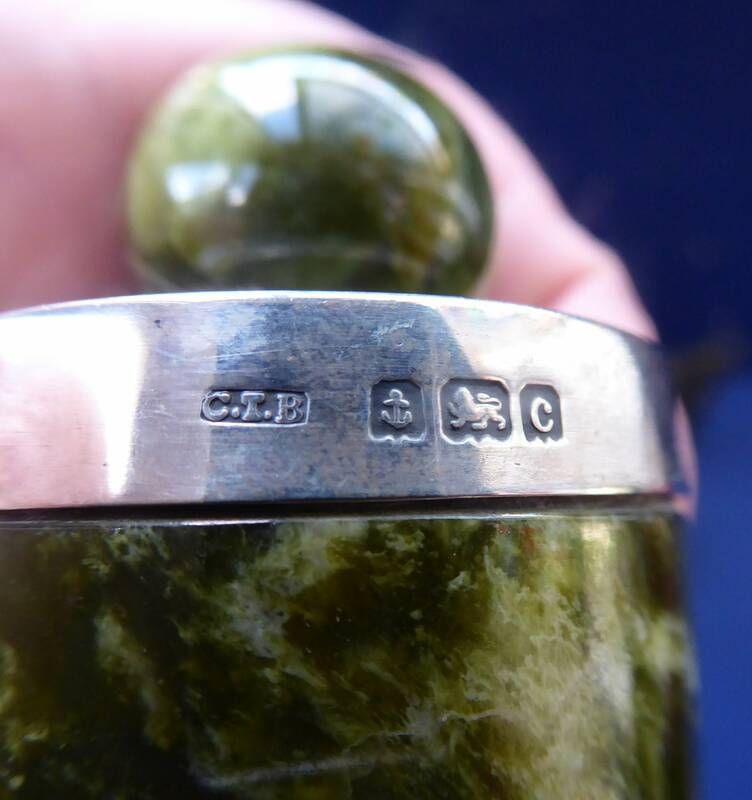 The two pots have hallmarked silver collars - and there is a hallmarked silver edging on the calendar for the dates sheets. 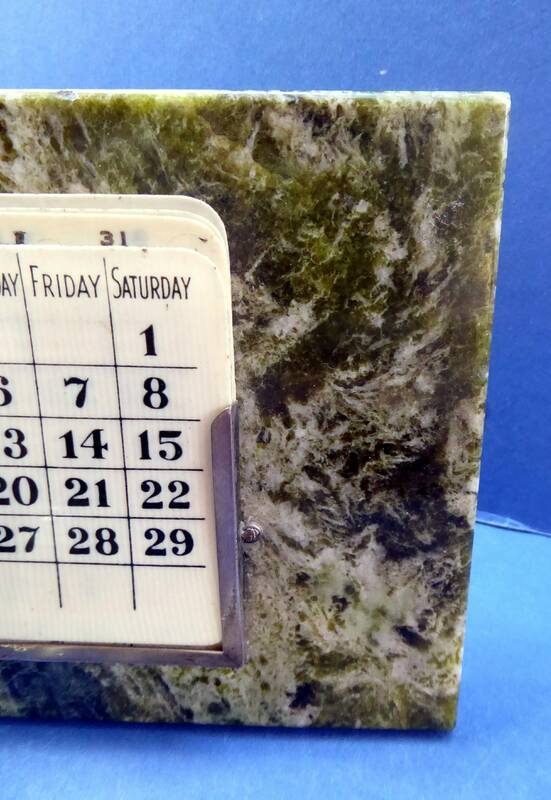 The calendar is made from a large single slab of marble - this measures 20 cm x 13 cm. It is held upright on display with the addition of a triangular piece of the same marble on the back. The back has a bevelled edge all around (a mark of the quality of the making). 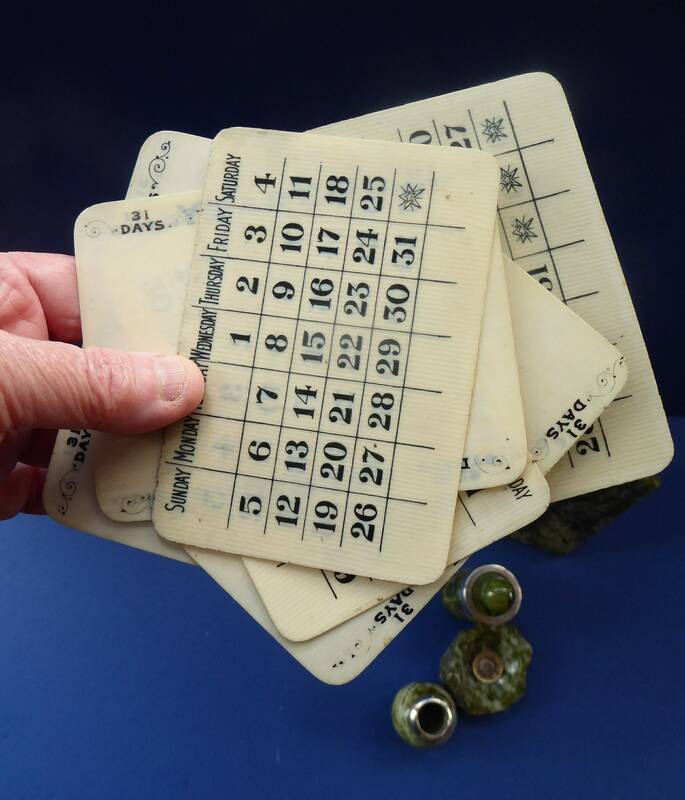 The calendar is a perpetual one with cards which can be turned to give dates of months of the year - and cards for the actual months. The cards are made of sheets of an early celluloid plastic with a fine graining. The use of celluloid would have been very modern at this time. The applied stand for the cards is made of angled ribbons of hallmarked silver - the hallmarked is rather small and think that it is a London one for the year 1910. 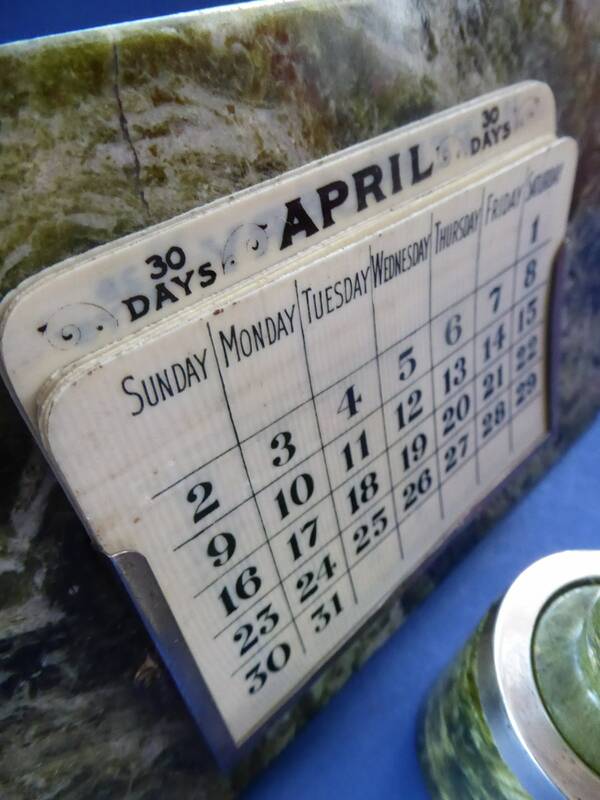 The calendar is in good condition with no scratches or chips and all the date cards are present in good clean antique condition - no scribbles or tears etc. 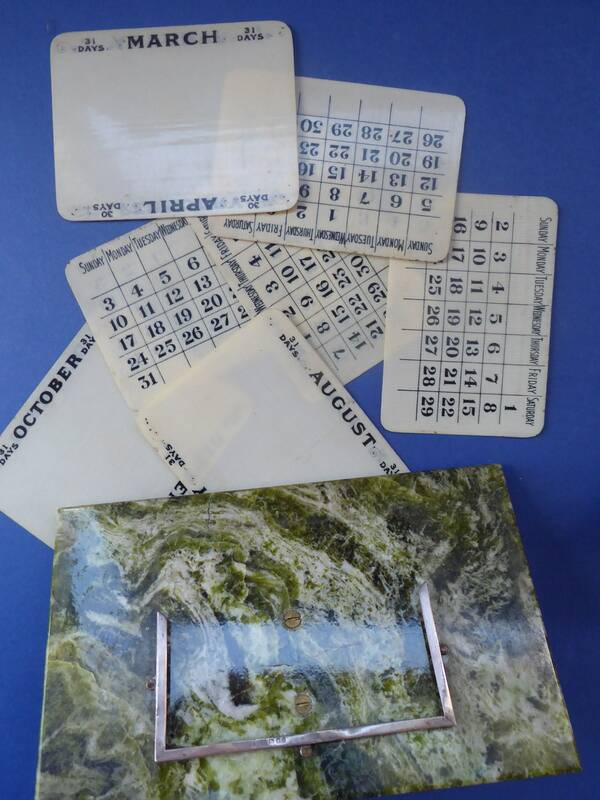 There is a little fissure to the marble agate just above the cards to the left - this is more cosmetic and commensurate with age - but stable and causing no issues (as photographed). Then we have the little globular open inkwell. This is in a matching marble and has a silver hallmarked collar - this is slightly earlier in date - and is hallmarked for Birmingham and I think for the year 1903. The marble of the inkwell is just fine - there is one teeny ween dent on the collar - but hardly noticeable unless on close up inspection. The inkwell is just over 1 1/2 inches in height and the diameter is 1 3/4 inches. Next is what I take to be the sand pot for storing sand to pop onto your ink when writing with a fountain pen. I think that this is just a wonderful wee pot. It also has a silver hallmark - and this time dated for the year 1902 - and with the maker's mark for C T Burrows & Sons (Charles Turman Burrows) who had premises in the Edwardian times in Branston Street in Birmingham. So again a quality item. 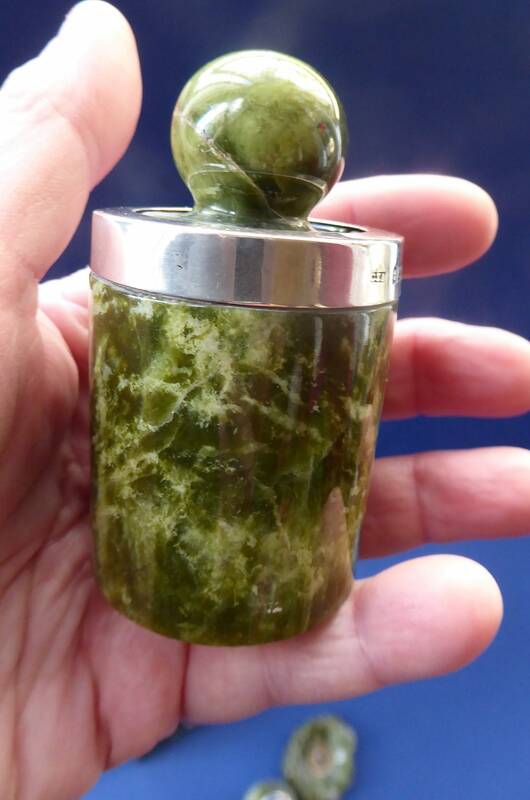 The little pot is ever so slightly darker a fine moss agate green colour - but only marginally so. Again, it is a fine quality item - without damages, no dents to the silver and with a nice snug fitting lid with large ball finial. From base to top of ball finial it is 8 cm and it has a diameter of 4 cm. 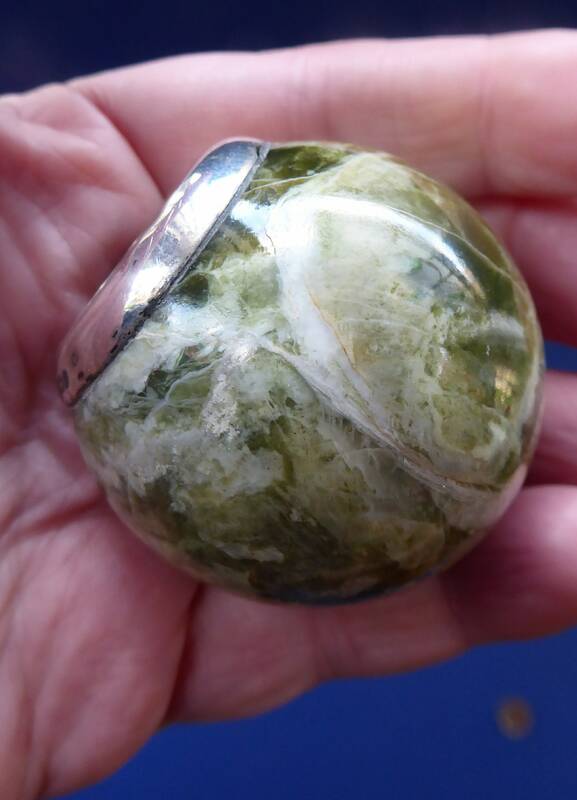 The final item is what I take might be a wee dish to store a little wet sponge on as a postage stamp wetter - and made of a green moss agate type of marble - it measures 7.50 x 6 x 2 cm. So there you go all details dealt with - as I have mentioned it is a fine quality group of four desk accessories - all antique pieces dating to the Edwardian area. Unpacked all pieces are 1.5 kg in weight. 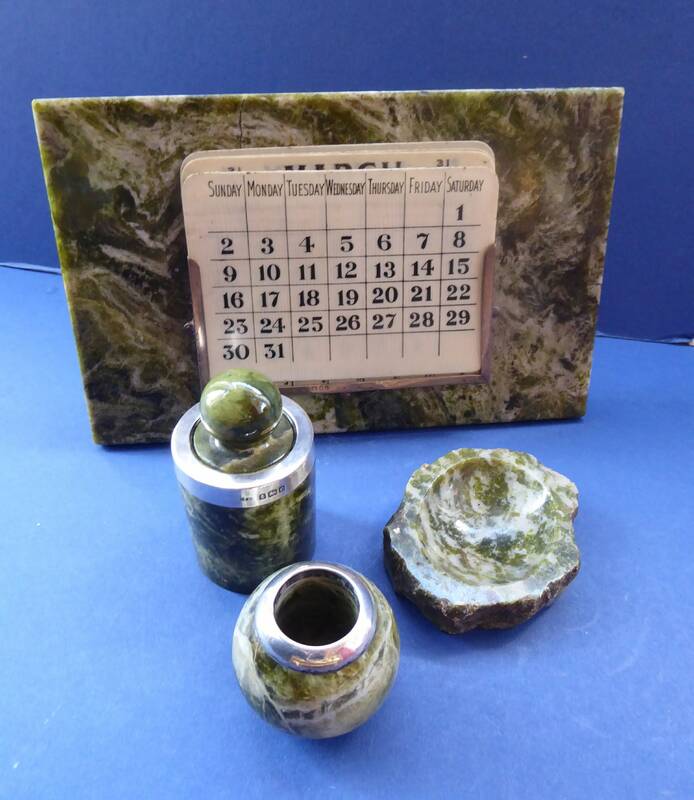 A fair price for this attractive antique set - it breaks down roughly as follows £65 for the calendar: £40 for the lidded pot; £30 for the wee inkwell and £15 for the stamp wetter (but all must be sold as the set). Postage quoted here is for next day special delivery with the Royal Mail. PLEASE ASK FOR A POSTAGE QUOTE OUTSIDE OF THE UK.